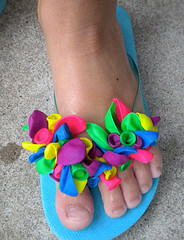 Decorate your own flip flops using inexpensive material like balloons, ribbons and fabric. 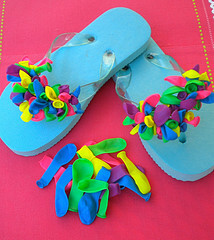 This flip flop craft can be enjoyed by girls of all ages. 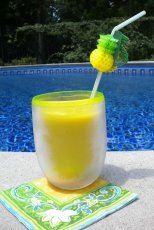 If you send out an e-vite ask your guests to reply with what size flip flop they wear. 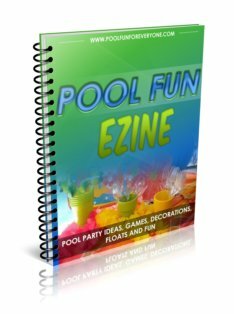 Get a supply of water balloons and flip flops from your local dollar store. Double tie water balloons along the strap of the flip flop. You can decorate the entire strap or just half way down the strap like these pictured. Alternate colors using a random color combination or try using just two or three colors if you'd like a color theme. As you can see, the results are great with so few supplies. No gluing, no cutting, just simply tying.